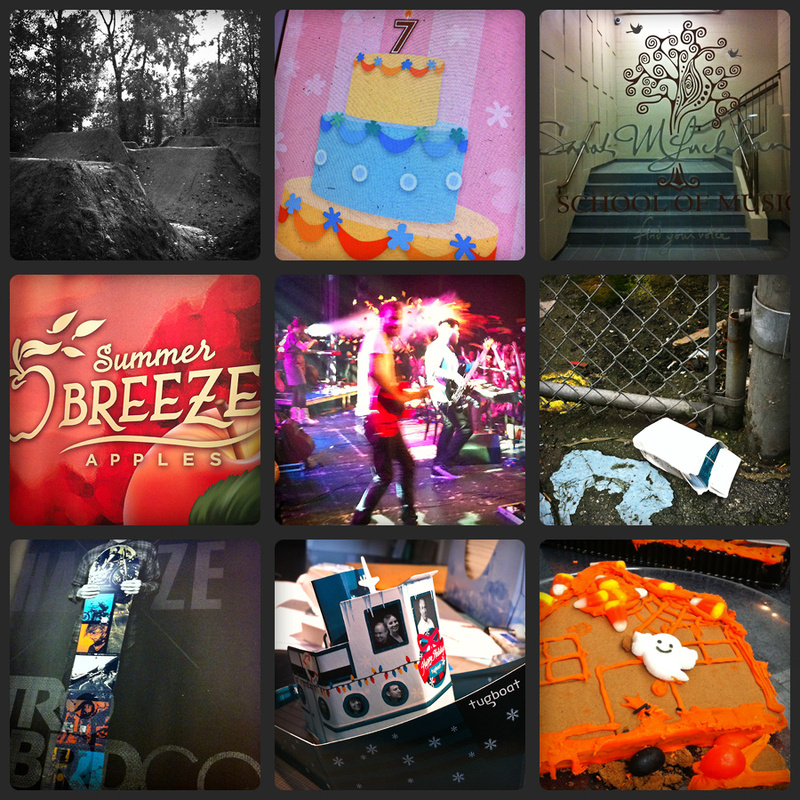 I’ve been pretty busy over the last couple months, so I didn’t get a chance to look back at my November photos until February of 2012. Looking back, November looked like a thin month for pictures, seeing as a lot of these are very ‘work-centric’ photos, and reference photos of things in progress. Vanier Park dirt jumps – one of the parks I worked on for over a decade – we were able to ride it well into November this year… That’s always a good thing to get a good long season in before the wet weather hits. A birthday cake illustration I was working on for Dandelion KIDS, a freelance client of mine. This was for an email/blog graphic announcing their 7th birthday – the illustration was based on a hand-crafted cake they made from boxes and textured materials. I came across the Sarah McLachlan School of Music – I’d heard about it, but didn’t know it was right in the neighbourhood, along 7th Avenue. I’ve got to admit, I’m Sarah McLachlan’s smallest fan, but she’s providing free music schooling to kids in Vancouver that couldn’t afford to do so otherwise, so that’s pretty cool. Hopefully she doesn’t teach the kids how to write ballads though. A photo of a large banner-stand sample from work… I’m impressed by how bright the printers can print on fabric today – in the past printing on fabric used to be so dull and lifeless, and this sample was just popping. We checked out Hey Rosetta! at The Commodore – you can see more pictures from the show here. A brand new pack of freshly printed business cards that belonged to one of the guys at work that had moved on. It must have fallen out of the dumpster at work, but it was sitting in the alley in such a way… It was just funny. It has a ‘screw you’ thrown on the ground look about it. But that’s probably just because there’s always just the most random garbage sitting in this part of the alley – always a surprise. This ad for Nitro snowboards was just printed so well, it looked really dimensional with the black/dark grey background that it made the colour part of the ad (the snowboard) just jump off the page. Considering there’s almost no control when printing an ad in a magazine, that’s a job well done. This is the Christmas card I made for the studio this year… This tugboat ‘card’ actually folds down flat and fits into an envelope. It took a couple days to get the dieline to work and fold down perfectly, but it was a fun project, right down to the illustrations. I’ll have to put together a post breaking down how much work went into this card – it was a big hit with clients. October’s final snack day at work kept the snacks going well into November… The ghost inhabited gingerbread house was shown no mercy into it’s final days.